Istanbul, Turkey – Thousands of Palestinians representing diaspora communities from 50 countries have gathered in the Turkish city of Istanbul to discuss establishing a political structure that will represent them better. While registering his opposition to the Istanbul conference, Tayseer Khaled, the PLO head of expatriate affairs in Ramallah, told Al Jazeera the organisation “had neglected diaspora Palestinians after it signed the Oslo accords with Israel”. He said, though, that his department was now working with diaspora communities in Europe and the US to resist Israel’s policies in the occupied territories. Currently, the diaspora has no representation within any organisational structure related to the PLO or the Palestinian Authority – a governing body formed in 1994. “We, Palestinians, must stand up to those who abandoned the Palestinian national project and replaced it with the Oslo agreement that ended up protecting and prolonging the Israeli occupation,” said Anis al-Qasem, an expert on international law and one of the founders of the former Palestinian National Council. “This is because it is afraid it will further undermine its weak legitimacy,” he said. No matter where the Palestinian youth have been raised, they always identify with their Palestinian heritage, that was evident from the thousands who turned out to attend the first day of the Palestinians Abroad conference yesterday. Held in the Turkish capital Istanbul, the conference was attended by over 4,000 people from 50 countries. Identity is a unique and personal concept and having a complicated identity, or setting up a home somewhere else is not a betrayal of your roots, she explained. Everyone had something unique to offer; from music, to poetry, videos, to art and personal stories. “Many forget that Christians are Palestinians too. We are a community of both Christians and Muslims. As a Christian, I identify with the Muslim community,” he added stressing the unity that the conference highlighted and stressed. Writer Dr Salman Abu Sitta called for there to be an organised manner for Palestinians in the diaspora to unite, identify and connect. A member of Lammeh, a production group produced a video interviewing Palestinians in the diaspora, added that no matter what, Palestinians “learn different languages as we scatter, but we always return to our Palestinian dialect”. Just as they came from different parts of the world, they came with different passions and talents that they brought together for their love for Palestine. Film producer Younis Abou Saleh spoke of how he uses film to invoke sympathy for the Palestinian cause and to raise awareness for what is happening to “his people”. He was also open about how difficult it is to convince others of his projects when he suggests a project on Palestine. Rama Ibrahim engaged the crowd playing Mawtiny (My nation) on the qanun. The audience raised their flag and their voices to accompany her music. The attendees watched yesterday with mixed emotions. There was pride for their homeland, joy that Palestinians throughout the world and through the many generations still hold their identity and love for their country. Many were visibly moved listening to the stories of those in the diaspora and remembering the suffering of Palestinians inside The occupied territories, but most importantly, there was hope. Palestinian athletes representing Palestine walked in the opening ceremonies of the Summer Olympics in Rio on Friday – marking the largest team since Palestine began competing in the Olympics in 1996. The team wore traditional embroidered dresses and kaffiyeh scarves, and waved the Palestinian flag. No athlete representing Palestine has yet won a medal in the Olympics, which sports analysts say is not surprising, considering the lack of facilities in Palestine, and travel restrictions imposed by the Israeli military authorities that control all aspects of Palestinian life. Because of these restrictions, Palestinian athletes are prevented not only from traveling abroad for competitions, but also from traveling within Palestine for competitions with other Palestinian athletes. The two swimmers who are participating in the Olympics point out that there is no Olympic-size swimming pool anywhere in Palestine (although there are many such pools in Israel, Palestinian athletes are not allowed to use them). Mary al-Atrash, who is a Palestinian Christian from Beit Sahour, swims in a pool that is half the size of the Olympic-size pool where she will be competing in Rio. She said that she does not expect to win a medal, noting, “Because of all the difficulties that Palestinians live under … it makes it harder to practice and compete in our sports”. Al-Atrash and the other athletes say that they hope their participation in the Olympics will help raise awareness about the plight of the Palestinian people, who have been living under Israeli military occupation since the state of Israel was created on Palestinian land in 1948. Despite some Israeli commentators’ claims that the six members of the team are not all Palestinian, the Palestinian athletes have provided documentation of their Palestinian identity – although a couple of them are refugees unable to return to their homeland by the Israeli occupation authorities. The Free Syrian Army’s Chief of Staff, Brigadier General Ahmed Berri, denied claims by Russian President Vladimir Putin on Friday that his country supported the FSA with arms and air cover. Berri said that Russia’s air force attacks FSA positions and the rebel-held areas on a daily basis, including field hospitals, public markets, bakeries and civilian homes. Berri said only a few of the Russian airstrikes have targeted ISIS positions. Berri added that Russia is an aggressor country that supports the murderous Assad regime which has committed the most heinous massacres against the Syrian people for over five years. Secretary-General Mohammed Yahya Maktabi said that Russia has become a partner to the Assad regime in committing genocidal crimes against the Syrian people as hundreds of civilians continue to be killed in the ongoing Russian air camping in Syria. Stressing the fact that the FSA has never asked for Russia’s military support, Maktabi called on Russia to end its aggression on Syria and stop targeting civilians, rebel positions and vital civilian facilities including schools and hospitals. Maktabi also called upon Russia to stop supplying the Assad regime with the means to continue the slaughter the people in Syria, which Russia has stepped up following attempts at reviving the political process. Maktabi pointed out that while Russia justifies its aggression on Syria on the pretext of fighting ISIS, the extremist group has made gains against the FSA as a result of Russian air strikes on its positions. Maktabi concluded by saying that Russia has claimed it intervened in Syria to help forge a political solution to the crisis. However, Russia has only brought about more bloodshed and destruction and made Assad more intransigent saying recently he would not negotiate with the Syrian opposition. Meanwhile, the US State Department said on Friday it was unable to confirm claims by Russian President Vladimir Putin that his country supported the Free Syrian Army, along with Syrian government forces, with arms and air support. State Department spokesman John Kirby said he had seen reports about Putin’s statement on Friday that Russia had supported the Free Syrian Army in joint operations alongside Syrian government troops against Islamist militants. “It’s unclear to us … whether these claims of support to the FSA are true,” Kirby said. “So I’m not in a position to validate the comments except to say that as we’ve said in the past, the vast majority of air strikes conducted by Russian military aircraft” are against groups opposed to Syrian President Bashar al-Assad and not aimed at Islamic State, he said. VATICAN CITY — The Vatican on Friday signed a treaty with the “state ofPalestine,” a development that the church hopes will lead to improved relations between Israel and the Palestinians. 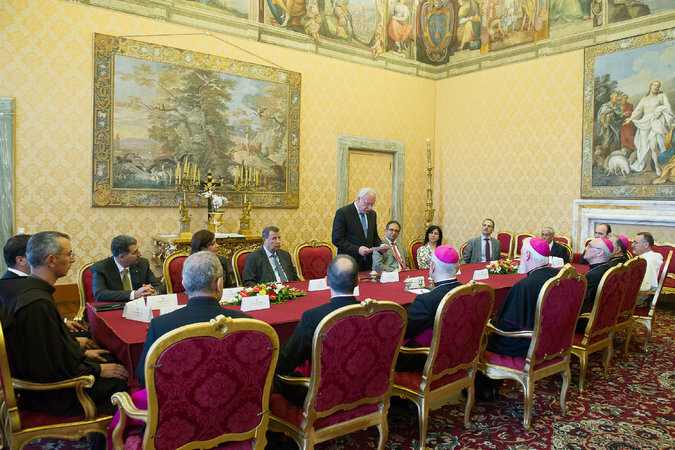 Archbishop Gallagher and Foreign Minister Riad al-Malki of thePalestinian Authority signed the treaty at a ceremony in the Vatican. The Israeli Foreign Ministry expressed its disappointment on Friday, calling the signing of a treaty “a hasty step” that hurt the prospects of peace. Arab ambassadors on Monday endorsed Palestinian amendments to a U.N. resolution that would call for an end to Israel’s occupation within three years, a proposal strongly opposed by Israel and the United States and virtually certain to be defeated. Jordan’s U.N. Ambassador Dina Kawar, the Arab representative on the Security Council, told reporters after the closed-door meeting of the 22 Arab envoys that the revised text would be submitted to the council later Monday. The draft resolution, obtained by The Associated Press, affirms the urgent need to achieve “a just, lasting and comprehensive peaceful solution” to the decades-old Palestinian-Israeli conflict within 12 months and sets a Dec. 31, 2017 deadline for Israel’s occupation to end. 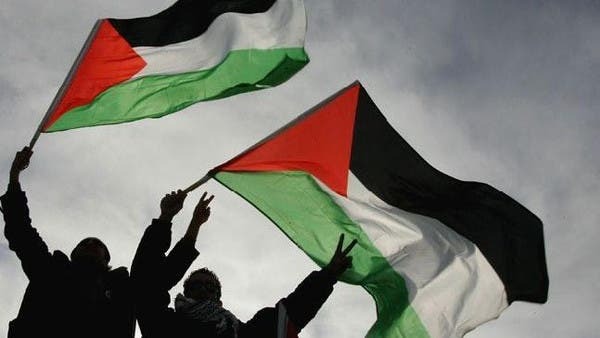 It calls for an independent state of Palestine to be established within the June 1967 borders, with East Jerusalem as its capital, and security arrangements “including through a third-party presence.” It demands “a just solution” to all other outstanding issues including Palestinian refugees, prisoners in Israeli jails and water. Even if the resolution musters the minimum nine required “yes” votes, the United States, Israel’s closest ally, is certain to veto it if necessary. The U.S. insists there must be a negotiated solution to the Israeli-Palestinian conflict. Palestinian President Mahmoud Abbas said before the Arab group met that the revised resolution would be submitted Monday and voted on Tuesday. The Palestinian U.N. Ambassador Riyad Mansour told reporters after the meeting that a vote “could happen tomorrow, or the day after tomorrow.” But Kawar, when asked whether the vote could be put off until after Jan. 1 said: “Everything is possible.” Five newly elected members joining the Security Council on Thursday are considered more supportive of the Palestinians than the five members leaving the council and could give them the nine “yes” votes to force a U.S. veto. Mansour, the Palestinian envoy, has said the Palestinians can’t return “to the same cycle of failed negotiations,” which he says Israel uses to entrench its occupation. He has urged international support for the resolution setting a 2017 deadline for a complete Israeli withdrawal. The Palestinians initially circulated a draft resolution on Oct. 1 asking the council to set a deadline of November 2016 for an Israeli withdrawal from all Palestinian territory occupied since 1967. France had been working for a U.N. resolution aimed at restarting Israeli-Palestinian peace negotiations, setting a two-year deadline for success. French lawmakers voted on Tuesday in favor of recognizing Palestine as a state, following similar moves in Britain and Spain as European countries try to restart the stalled Middle East peace process. Palestinians are seeking to achieve statehood in Gaza and the Israeli-occupied West Bank with east Jerusalem as the capital. With little progress on reaching a settlement, they have been lobbying foreign powers for international recognition. During a debate on the issue Friday, Foreign Minister Laurent Fabius stressed that Paris would recognize Palestine if diplomatic efforts failed again and urged a resolution to the Middle East conflict within two years. France is spearheading a drive at the United Nations to unfreeze the moribund peace process and the Palestinian envoy to the UN said earlier Tuesday a draft resolution could be submitted to the Security Council by mid-December. Riyad Mansour told AFP the text was set to lay out a time-frame for negotiations on a final peace deal and possibly a deadline for Palestinian statehood. It would also pave the way for a last-ditch international conference that France has offered to host. This European initiative was expected to be discussed in Brussels when US Secretary of State John Kerry holds talks with European ministers during a NATO meeting. “If these efforts fail. If this last attempt at a negotiated settlement does not work, then France will have to do its duty and recognize the state of Palestine without delay and we are ready to do that,” Fabius told MPs on Friday. The French vote came hot on the heels of a near unanimous vote in favor of recognizing Palestine in the British and Spanish parliaments, as Europeans seek alternative ways to push forward efforts towards peace. Sweden’s government went even further, officially recognizing Palestine as a state in a controversial move that prompted Israel to recall its ambassador. At a pan-European level, the European Parliament is expected to hold a vote later this month on recognizing Palestine and EU foreign policy supremo Federica Mogherini is also pushing for the creation of a Palestine state. “Governments and parliaments are taking action. That momentum will grow,” said United Nations chief Ban Ki-moon last month. However, lawmakers in Paris were more divided on the issue than their British and Spanish counterparts, reflecting the sensitivity of the debate in France, which is home to Europe’s largest Jewish and Muslim communities. Senior UMP lawmaker Christian Jacob told MPs ahead of the vote: “Who are we kidding? We are kidding the French people if we think that the parliament will have any influence at all” on the peace process. France was the scene of several pro-Palestinian demonstrations during this summer’s 50-day offensive by the Israeli army in Gaza that killed more than 2,000 Palestinians and dozens of Israelis. Some of these turned violent with looters in July destroying Jewish businesses and shouting anti-Israel obscenities in the Paris suburb of Sarcelles — sometimes known as “Little Jerusalem” for its large community of Sephardic Jews. The Palestinian Authority estimates that 135 countries have now recognized Palestine as a state, although that number is disputed and several recognitions by EU member states date back to the Soviet era. Palestinian president Mahmoud Abbas said he will rethink the Palestinian Authority’s security cooperation with Israel if the UN Security Council does not recognise Palestine as a state. Abbas made his comments to Arab League foreign ministers in Cairo on Saturday during an extraordinary meeting to discuss the situation in the Palestinian territories after months of unrest in Jerusalem which has spread to the West Bank and Arab communities inside Israel. Palestinians are unable to wait while “Israel creates facts on the ground through continued building of settlements,” Haaretz quoted Abbas as telling the ministers. Abbas also repeated that the PA will seek membership in the International Criminal Court should the UN bid fail, a claim he has made before, most recently when he spoke at the UN General Assembly in September. A week after told the UN that he would seek an end to Israel’s occupation of the West Bank with a statehood bid, Palestinians circulated a draft resolution calling for Israel to withdraw from all Palestinian territory occuped since 1967, including East Jerusalem, by November 2016 and for an international force to replace the Israeli army, according to news reports. Abbas has previously said that the Palestinians are under heavy pressure from the US to drop the UN bid, including risking $700 million a year in US aid. US officials have said they object to the bid as premature and damaging to the negotiations process. On Saturday, he asked Arab League ministers to support the Palestinian resolution which he admitted had made them look like “a laughing stock”. Abbas’ comments on Saturday will raise questions as, in September, it emerged that he had stopped a Palestinian application to join the ICC in the middle of this summer’s war in Gaza. His blockage of the application followed a leaked recording of Palestinian chief negotiator Saeb Erekat claiming the PA president had promised Israeli Prime Minister Benjamin Netanyahu he would not apply to join the ICC. Further pressure was applied on Abbas when Hamas declared it was prepared to incur the risk of prosecution from the ICC for rockets they fired at Israel. Hamas’ declaration prevented Abbas from claiming that he needed the consent of all Palestinian factions before signing up himself. ‘The European Union should play an essential role and together with other relevant regional players should help re-launch the peace process and ensure stability across the region. Only a sustainable agreement and reciprocal recognition can guarantee the right to peace and security for both sides,” added MEP Boştinaru. ‘Therefore, we support Federica Mogherini, the EU’s high representative for foreign affairs, in her recent efforts and in the framing of a concrete European strategy for the Middle East,” he added. The (S&D) called on all EU member states to recognize the state of Palestine, underlining that this is absolutely in line with the decision taken by the United Nations General Assembly on 29 November 2012, stated the release. ‘The S&D Group is deeply concerned by the stalemate in the dialogue and the mounting tensions between Israelis and Palestinians, and we condemn in the strongest terms all acts of terrorism or violence against innocent Israeli and Palestinian citizens,” he added. 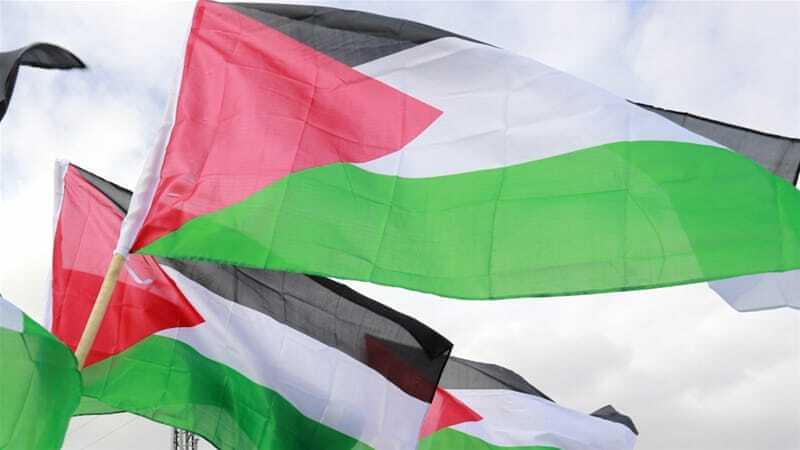 ‘The S&D Group reminds fellow Members of European Parliament (MEP) from all political groups that the Parliament decided in plenary that a resolution to recognize Palestine’s statehood would be adopted next plenary session. The S&D Group expects the other groups to honor their commitments to this decision,’ said Pittella. Dozens of Palestinian activists climbed over Israel’s separation wall to Jerusalem on Friday at a checkpoint near the West Bank city of Ramallah as tensions rise over scattered attacks from both sides and access to holy sites. Between 30 and 40 protesters were able to scale the over 25-foot high concrete wall using ladders and ramps after activists cut the razor wire lining the top of the wall, Samer Nazzal, a Palestinian photographer, told Al Jazeera. The protest was part of the #On2Jerusalem campaign organized by local nonviolent protest groups known as Popular Resistance Committees, which often organize peaceful protests against the wall on Fridays. After scaling the wall, activists returned to the West Bank side of the wall, and no clashes with Israeli security forces were reported. Israel began construction on the wall in 2002, saying it was meant to prevent attacks. But critics argue it is effectively a land-grab because over 85 percent of the wall is constructed inside the Green Line — the internationally recognized borders between the West Bank and Israel. They argue the wall serves as a de facto annexation of Palestinian land. Also in the West Bank near Ramallah on Friday, Palestinian youth clashed with Israeli security forces at Qalandia checkpoint after activists scaled the wall there as well. Israeli soldiers fired live ammunition, tear gas, stun grenades and rubber-coated-steel bullets at protesters and those who were symbolically attempting to march to Jerusalem, Palestinian news website Maan News reported. Though the city is just 10 miles from Ramallah, because of the checkpoint and wall it can take over an hour to travel to Jerusalem, and the trip requires a special Israeli permission for West Bank residents. Palestinian protesters also descended on Hizma on Friday, a village near Jerusalem where there is another checkpoint separating West Bank residents from the city. Several protesters were injured when Israeli forces opened fire with rubber-coated steel bullets and tear gas to prevent them from crossing the checkpoint, according to Nazzal and local media. Despite failing to cross into Jerusalem, activists said they succeeded in closing the checkpoint and road, which is the main entry point for Israeli settlers living in the West Bank to access Jerusalem. Dozens of Palestinians also demonstrated at the entrance of a major Israeli settlement bloc in the West Bank called Maale Adumim, which has a population of over 40,000 and, like all settlements, is closed to most Palestinians. A series of attacks on Palestinians, as well as their property, have been blamed on Israeli settlers living in the West Bank, including hit and run attacks that have killed children and the torching of mosques and agricultural fields. A spokeswoman for the Israeli military said there was an “attempt” to cross the wall, referring to Friday’s action near Qalandia, but did not provide further details, Maan reported. Armed with hammers, Palestinian youth last weekend smashed a hole in Israel’s wall on the 25th anniversary of the fall of Berlin’s wall.